The verbena is a vigorous, heavy bloomer that fills your garden with colorful flowers throughout the summer months. 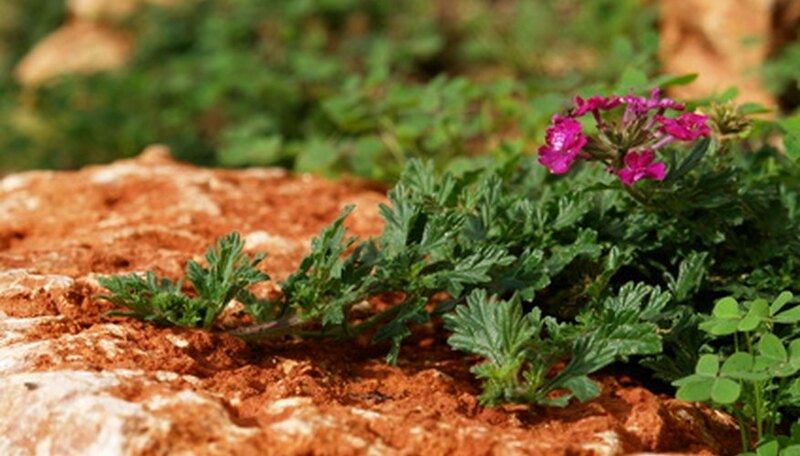 Verbena comes in a multitude of colors and heights that range from less than a foot to over 6 feet. Verbenas are rapid-growing plants that often spread outside of their boundaries in the garden or flower bed. They are tolerant of trimming, so prune them back to keep them under control and looking their best. Known for it's ability to spread, clump verbena (Verbena canadensis) blooms from in late spring and lasts until the fall. Clump verbena is a low-growing plant that reaches heights between 8 and 18 inches. Plant the clump variety of verbena in areas with full sun exposure and in soil that is well-drained. Mainly used as a ground cover, in flower beds and as an edging plant, clump verbena produces a red, white, purple or pink flower that attracts butterflies to your garden. Considered ideal for use as groundcover on slopes and banks, moss verbena (verbena tenuisecta) thrives when planted in areas with good drainage and full sun exposure. Moss verbena is flat-growing, ranging from 6 to 12 inches in height and produces tiny clusters of purple, white and plum-colored flowers. Although moss verbena blooms profusely during the spring, flower production diminishes during the heat of the summer months. Flowering will increase again during the cooler fall weather. The brightly colored pink, red, purple and blue flowers of the annual verbena (Verbena X hybrida) make it an attractive choice for rock gardens and window boxes. Annual verbena reaches heights of 12 inches, requires at least 6 hours of full sun each day and thrives when planted in fertile, well-drained soil. The annual verbena blooms abundantly during the spring but flowering slows during the warm summer months. The blooming purple flowers of the Brazilian verbena (Verbena bonariensis) attract butterflies to your garden and flower bed. Brazilian verbena has a long bloom time, which starts in June and lasts until the first frost. One of the taller varieties of the verbena, the Brazilian verbena reaches heights of 4 to 6 feet. Brazilian verbena,often called Verbena-on-a-Stick, requires well-drained soil and full to partial sun exposure to thrive. The short-lived sandpaper verbena (Verbena rigida) is an herbaceous groundcover that is helpful in controlling erosion on banks and slopes. (see reference 5) Sandpaper verbena grows to be a foot tall, has a 4-foot spread and produces a bright purple flower during the summer and fall months. Plant sandpaper verbena in any type of soil that is well-drained and place gardens or flower beds that receive at least 6 hours of full sun exposure each day. What Flowers Bloom All Summer Long?